Hi Saddam, could you please tell me where you got those 2 IR Sensor Modules from ? These IR sensor Modules are easily available online (ebay/amazon) or offline at local electronics components shop. The IR SEnsor modules I have are not giving any output, i think it's not compatible with arduino. Any IR sensor module should work here, please set the proper sensitivity of sensor by rotating the potentiometer on it. Learn the working of IR sensor module here. Otherwise check the circuit and code once again. This project is already counting multiple persons, please check the Video. yar this programming is not working right because it does not count correctly . when you keep your hand in front of IR module so it will continuous the counting . did you already have a corrected programming? How can I use the counted value to be sent to the serial out pin that to be used by a computer? You can easily send this data to Computer, by using some code (Serial.begin(9600); Serial.println("Hello"); ) and Arduino IDE. There are numerous tutorial on the web. How can i connect 220 Volt AC bulb to it. Please help immediately. If you look at the circuit diagram, it already has 220v AC bulb connected through the Relay. i used this code iny project but the range of the ir sesnor is only of 1-2cm soo i have to increase the distance so pls give me the code to increase the rangee..
use variable resistor placed at IR sensor module for increase sensing distance. can you advice?? i tried adjust the sensitivities but in vain. Please check your circuit connections and code twice. Do not keep any unnecessary moving things in front of IR sensors. Try understanding the code, and change it accordingly. There is one IR pair for Entry detection and another for Exit detection, if you keep your hand in front of both the IR pair, then the number will continuously goes up and down. And the value shouldn't go negative as there is condition for that in the code, please check. Thanks for replying... I altered the code only but left the circuitry the same... It works now. Now will try optimize and add further components. Hi! I have faced the same problem with you. I had tried to modify the code and still cannot get it correctly. Would you share your altered code with me? I really need your help to complete my final year project. I don't have a lot of programming experience, and I am struggling with fixing the code. Would you please be able to send your altered code? Can u plz send the correct code. sir can you please send me the altered code? sir i am facing problem in connecting relay with 5 leg can u please help me. Is there anyway to prevent the counter from moving up or down when i place my hand infront of 1 of the sensors constantly? If ever i leave my hand infront of 1 of my sensors, the count eitheir goes up or down. So in a real case scenario, if someone stays infront of the door for sometime, either the count will go continuously up or down. and it will affect when the lights should go off. Good thought, for this you can either increase the Delay in code or add some condition to avoid this, like only increase the count if IR sensor is switched from Off to ON state, and dont increases count if IR sensor is previously ON or continuously getting digitalRead(in). Try around some codes and share with us. Please tell me how to change program according to this above mentioned. Can we use proximity sensor module on this? Can we have a circut diagram using this type of module? yes, basically IR sensor belongs to Proximity sensor. Can you pls send a circuit diagram?What are the values of the resistances and the pins they need to be connected? Resistor values are clearly mentioned in the Circuit Diagram. That's how it is supposed to work. You can increase the delay to 2000 in 'IN' and 'OUT' functions. Also read all the above comments, solution has already been suggested. what type of sensor modules used in the circuit,tell me the ic number in the module.....? after burning the code which lights in arduino board will glow or blink...? after bulilding above circuit display is showing 1 and 0 continuously help me to solve this.....? @Naveen: Please read all the above Comments before asking any question, your questions are already answered. i didnt not use the IR modules you have, i built my from scratch using IR LEDs, resisters, and 741 op-amp. when i plug my circuit into the arduino it counts on its own without the IR beam being broke. what kind of output signal is the arduino looking for? it also will count negative, what can i add to the code to prevent that? sir I am doing a mini project on your idea. but I am facing some problems that my LCD is not showing any single alphabet. I have checked all the circuitry, its fine. is there any change should made in code for this. actually sir I am from mechanical dept that's why I don't know much programming. can you please help me in this? if there any IR module available for proteus ....if available where can i download it..?? you may use torch ldr in proteus in place of ir sensor module. could you able to program LDR in your circuit? i compiled the code ....but when i uploaded it the light is continuously glowing !!!!! will it work without the lcd ..??? i went through the program and what I didn't understand is how you you are determining if the person is leaving or entering the room. and also you seem to have connected the IR sensors to analog pins, so shouldnt it say " analogRead()" instead of "digitalRead()" ? Hello everyone, i selected this project as final year project. but i also try to add more things... and i try to make it for a class room where the student and teacher separately count and total persons too. and for teachers count use a keypad. and also give me some idea which is possible to add in mine project..
hey, i made this project and i saw that the led that is operating through the relay glows when the relay goes LOW and vice versa. I checked my hardware and the wiring. Why is that? You must have interchanged the NC and NO, please check. Can you please get me the modified code for counting the total number of persons entered in the room for a particular period.? @charlei @naibin and @hareesh: The code given is full and complete, please go through the above comments, some people modified the code accordingly and you can also modify the code according to your need. I am from Bangladesh, we have a problem with electricity in our country. 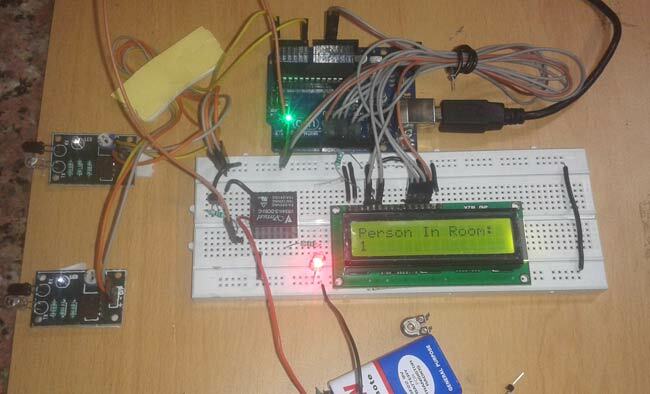 Can u help me to save last status in epprom at ATMEGA328 ? If you pls send me..
Sir, Can I use IR collision sensor in this project? All the components, circuit, code are already given in the project, please check. Relay is to operate any AC appliances instead of LED, while some one is passing through. what if two people enters the door at time? Sir, how will the code change accordingly if I use microcontroller 8051 in place of aurdino board.please suggest me if there is modification needed on this program.